It’s vast! It’s sweeping! It’s ambitious! Sometimes I’ll read a Strib article on both the website and in the paper edition. Usually the paper edition comes first over breakfast. The headline above was in the paper edition. I’d guess it’s the headline in all the editions sent to greater Minnesota. It’s the kind of headline you might see reproduced in lurid, grainy black and white television political ads. Headline writers are well known for their hyperbole, puns, and wooden imagery, but I think “vast” overstates it. There are vast wastelands, the vastness of deep space, the vast and trackless desert . . . Well, you get the idea. 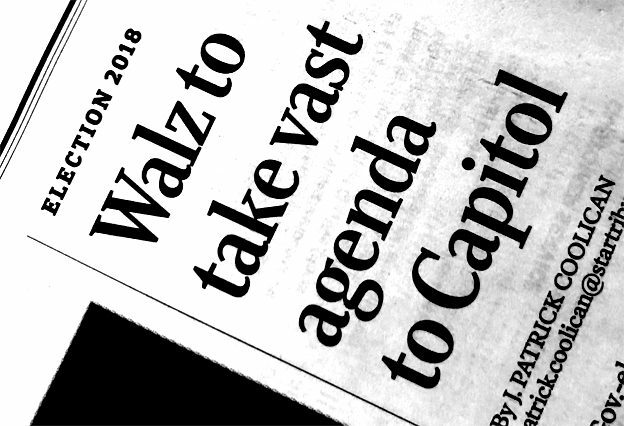 From spending increases for schools, broader access to publicly funded health insurance, a gas tax increase for road improvements, new limits on gun sales and even sleeper issues like marijuana legalization, Walz and a new Democratic majority in the state House will be looking to deliver on the priorities of the voters and interest groups that carried them to victory. It is fair to call that ambitious, I suppose, maybe, but calling it vast or sweeping makes Walz sound like Vladimir Lenin, although as I sit here, I don’t know what Lenin’s position was on Mary Jane. Somebody could look it up. The point of this is to recognize the power of headlines to shape perceptions. 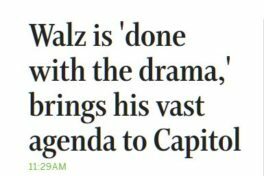 If somebody glances at that headline in the restaurant copy of the Strib in, say, Glencoe, she might be on the horn to Glenn Gruenhagen saying that Walz must be stopped. Not that Glenn in particular needs much persuading on the subject, anyway. The careful consumer of news reads beyond the headlines. Where have you gone, Gov. Kasich? Strib letter writer wins a Spotty!